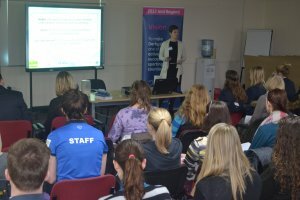 Derbyshire Sport's 'Insight to Action' workshop. To maximise the numbers who not only take part in sport and physical activity across Derbyshire, but go on to excel at a high level, it's vital to have a strong sport system in place. At Derbyshire Sport we provide a strategic lead to ensure the continued development of that structure so it provides opportunities for all - including young people, adults, those with disabilities, volunteers in sport, coaches and clubs. You can find all the latest information on the Derbyshire sport system, including key sporting contacts from across Derbyshire, employment opportunities, research and insight and guidance for those looking to fund physical activity or sport-related projects. There's also details on our staff and how to contact them, how Derbyshire Sport works and how we are governed, a guide to our policies and plans and where you can find us.